For the first time, SafeGuard4Kids attended the National PTA Convention. Held in Charlotte, North Carolina, the convention brought together PTA delegates from all over the country. While we can make noise about bringing lap-shoulder belts to school buses, and we can strike down the misinformation out there about them, the only people who can truly bring about change are the kind of men and women we met this past week. Our team really didn’t know what to expect from our first convention, but we were blown away by the passion and commitment of the people we met. So many told us they’d wanted lap-shoulder belts on school buses for years, but they weren’t sure what they needed to do to make it happen. We were happy to give them the tools and resources their districts need to bring about this important safety upgrade to their school buses, and we are honored to partner with people who are willing to advocate so strongly for the improved safety of our nation’s children. 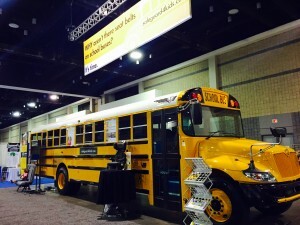 Thank you to everyone who stopped by our booth to chat and to learn the benefits about SafeGuard lap-shoulder belts on school buses. We hope the convention was as rewarding for you as it was for us, and we look forward to seeing you next year!